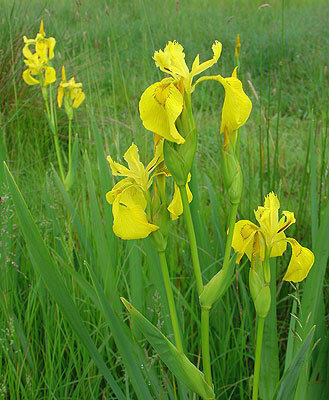 This vigorous marsh-loving plant grows in large clumps of sword-shaped grey-green leaves and produces elegant, yellow to almost orange flowers. Each flower is composed of three fall petals with faint brown markings and three erect standard petals which are smaller and unmarked. It is a widespread and common species of wet ground - marshes, pond and river banks, meadows, flushes and margins of reedbeds. An alternative name for this flower is 'segg', which derives from an Anglo-Saxon word meaning 'short sword', referring to the shape of its leaves. It has been given the name 'Yellow Flag' due to how it resembles a flag blowing in the breeze. In Greek mythology the word 'Iris' is derived from 'The Goddess of the Rainbow' and refers to the varied amount of colours within the Iris family.